Based on reviews from 1,208,326 users. 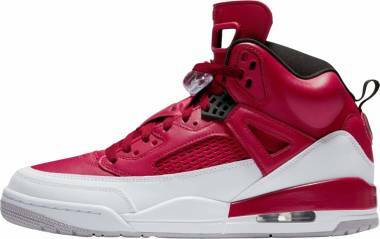 Learn how our rankings work or see our guide to red sneakers. Updated Apr 2019. In lifestyle sneakers domain, performance is the next most important to its followers. Color and style are generally the primary elements we consider when picking our casual kicks. As we age, we are likely to be more specific, critical, and practical in choosing our pair that must be timeless, appealing, and versatile. Because of that, it led us to an idea of rather not tackling about the muted and dull colorways that many consider classic, versatile, and easy to style. Instead, owning the striking red sneakers is something we want to go into especially for the sneaker freaks who wish to achieve dress down look, relaxed vibe, and edgy take on their classic guise. Traditionally, because of its bright and noticeable features that create an avant-garde feel, most people shy away from wearing red sneakers. However, with today's current trend, sporting the vibrant, out of the ordinary red sneakers is a fashion statement rather than a catastrophe. 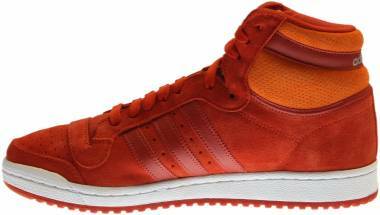 The Three Stripes brand offers some of the most popular and highly-sought after red sneakers in the market today. Its lineup brings comfort, stylistic versatility, and affordability. Initially presented in 1982 as part of the City Series, this model was associated with the European football-casual movement. It displays the iconic T-Toe suede overlay with unique side panels of the midsole. Adidas re-launched this model in 2014 that displayed the timeless elements revamped with modern details. While the Adidas Matchcourt Mid is inspired from a vintage 80s tennis sneaker, this mid-top shoe was introduced as a skateboarding kick. The brand reinforced its toe bumper and eyestays for durability and support. Like most of the skate shoes, Adidas unveiled these red sneakers with robust and flexible outsole for superb grip on and off the board. Adidas conceived the Swift Run in 2017 that was taken a cue from the 80s running silhouette. This model has Primeknit upper rested atop an EVA midsole with color-contrasted rubber outsole. The brand added the Torsion technology in the midfoot to provide better support, especially during the quick turns. A Nic Galaway design, the franchise-favorite Adidas NMD_XR1 features a renowned silhouette loved by people from all walks of life. The brand unveiled this iteration in 2016 with boosted support, comfort, and durability without ignoring the fashionable look. With its various colorway options, this kick has been a smart choice for buyers who prioritize functionality and stylish fashion. 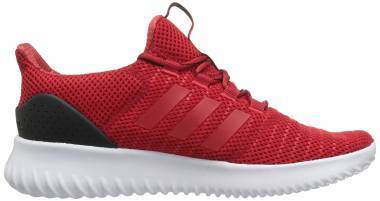 The Cloudfoam Ultimate from Adidas represents the NEO sub-category for its refreshing look with a price range that is within the budget of the target market, the younger generation. This casual kick displays sock-like knit upper with round toe and available in various colorways to match whatever mood of its wearers. The Adidas NMD_XR1 PK stayed authentic to the popularity, comfort, versatility, and praiseworthy aesthetics of its lineage. 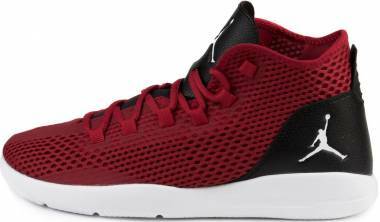 These red sneakers boast its breathable Primeknit upper reinforced with a sleek caging-lacing system. The Boost sole intensifies its cozy ride apt for all-day use. With its clean silhouette, the Adidas Gazelle has proven its rank in the iconic pieces existed in the sneakers sphere. The Gazelle was launched in the 60s and reached it its peak in the 80s when hip-hop celebrities were seen sported this kick. This trainer-inspired kick is sold in various colorways with an iconic T-Toe overlay on premium suede upper found resting atop a rubber gumsole. Its unassuming look enhances its versatility that can match almost any casual ensemble. One of the notable releases of the Gazelle is the Gazelle Super available in various colorways dressed in premium suede. This iteration boasts its retro appeal that was able to withstand the test of time. This casual kick has turned a fashion staple for the various arena for its straightforward design. Included in the Adidas Originals' Terrace Collection, the Adidas Bermuda features the classic silhouette from the 70s until the 80s. These red sneakers displayed football-inspired look and were re-introduced in 2017 presenting suede upper with the iconic serrated three stripes and tonal sole. This sneaker took a cue from the 70's running profile of the Three Stripes. The vintage Iniki Runner brags a retro appeal with modern technology - the Boost midsole. Its classic look and excellent comfort and breathability, this shoe seamlessly turned a go-to pair for many buyers. Adidas unveiled the ZX Flux to defy the popularity of the Nike Roshe Run directly. It was modeled after the ZX 8000 running footwear and simplified to suit as a casual sneaker. These red sneakers are made of a single piece upper with reflective details for added style. Also known as the "poor man's NMD," the Adidas X_PLR crows its versatile, high-quality, and stylish kick in a price range that won't hurt your pockets. This elegant, sporty kick carries all the elements essential in the casual domain without the need to shell out too much money. The Tubular was launched in the 90s as a sole for running footwear. This design was inspired by the inner tubing of car tires and presented a technology that is way ahead of its time. This model caught the attention of many buyers as it displays appeal that is similar to the renowned Yeezys minus the sky-high pricing. Released in monochromatic colorway, these red sneakers have stayed authentic to its iconic lineage. The Adidas Superstar RT iteration delivers superb comfort, durability, and eye-catching appeal that will make its onlookers ask for more. Adidas changed the lives of many travelers, casual sneaker lovers, and practical shoe buyers in 2015 when they presented the NMD line. This series was inspired by the silhouette from the Three Stripes' archive - Micro Pacer, Rising Star, and the Boston Super. The first model in the series is the NMD_R1 that features running-sneaker profile with soft upper and the ultra-responsive Boost technology. This sneaker boasts its superb comfort and style that can be worn for almost any casual events. Initially introduced in the 50s, the Samba silhouette is considered the second highest selling design of the Adidas, next to Stan Smith. The brand re-launched the Samba 65 years after its debut in the market and dubbed it as the Samba ADV. This iteration had skate-ready features but retained few of its soccer-kick inspired elements. 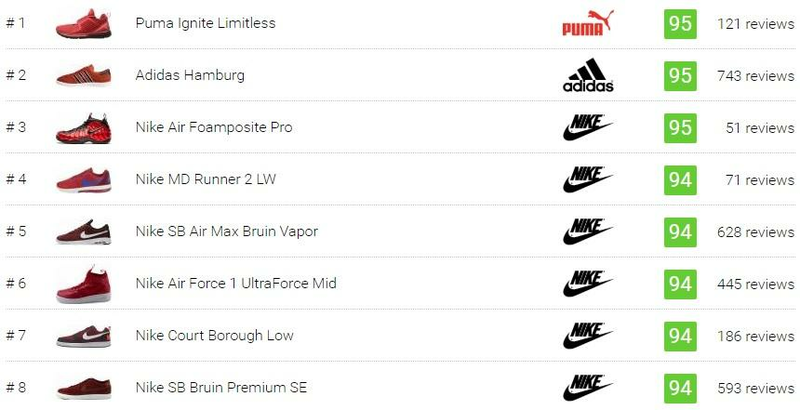 The Swoosh continues to be the top dog in the sneaker world. Sneaker fans continuously follow Nike’s releases throughout the year. 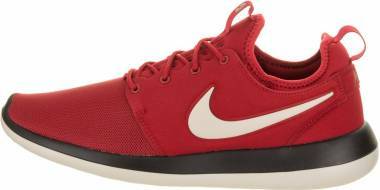 There are several red sneakers from Nike that have caught the fancy and adoration of the sneaker community for so many years. This model is taken a cue from the 90s running kick with a perfect blending of breathable mesh and suede overlays. This model displays the versatility that can practically match any casual get-up. The Nike Bruin was first presented as basketball footwear in the 70s. From the hard courts, the Swoosh re-engineered this classic silhouette and turned it into Nike SB Air Max Bruin Vapor. The red sneakers of SB AM Bruin Vapor have premium materials with a superb shock-absorbing unit called the Air-Sole unit. This model is the modernized take of the icon Air Force 1 presented in 1982. The Nike AF 1 UltraForce Mid introduced in 2017 bears a lighter and comfier vibe without overlooking the timeless appeal. 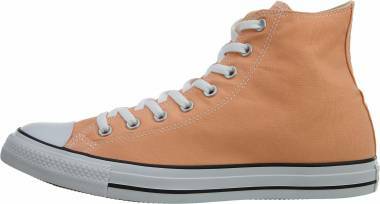 This monochromatic sneaker boasts its fashionable look while being offered at an affordable price point. Collaborations are not new in the sneakers world. When the Three Stripes partnered with by sneaker retailer Nice Kicks in 2010, they conceived stylish red sneakers and called it Nice Kicks x Adidas NMD. They used the NMD Runner Primeknit profile and tweaked with a unique design on the upper. 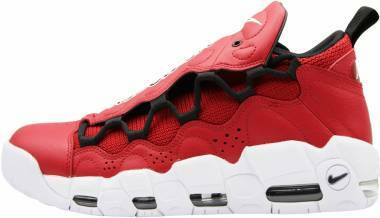 Another model with red sneaker variation is the Nike Air Max Motion LW SE launched in 2014. The well-ventilated upper suits the warm weather hugs the feet comfortably while delivering support. These fantastic red sneakers display features molded from the iconic Nike Air Force 1. The Nike Court Borough Low features perforated leather upper rested atop a rubber cupsole and finished with the iconic Swoosh. This model was launched in 2016 and showcased retro vibe with a modern lifestyle feel which has been accepted widely by many fans all over the globe. The Nike Bruin silhouette was released in 1972 and gained popularity when it was seen worn in the favorite 1985 movie "Back to the Future." The modernized version Nike SB Bruin Premium SE released in various colorways features an uncomplicated suede upper with superb flexibility and lightness apt for the skate use. One of the priciest basketball shoes in the 90s, Nike released the Air Foamposite One in 1997 and quickly turned as one of the favored red sneakers by basketball players. This model came from the idea of the molded sunglasses case that is made of the EVA foam. It displayed futuristic vibe and used the innovative liquid Foam mold for a seamless finish, carbon-fiber plate in the midfoot, and the Zoom air unit. Added to the impressive line of Nike SB line, the SB Zoom Stefan Janoski Canvas features minimalist design stuffed with firm, supportive elements that suit the hard-wearing style on the skateboards. This sneaker is not limited to the board use, but it displays an upscale look that can go well with several casual mix and match. The Jumping Cat brand is slowly making a headway in the sneaker market mainly because of more visually-appealing sneakers and a slew of famous celebrities who are now endorsing or collaborating with their sneakers. Some of these red sneakers from Puma are literally worth swooning over. This model was launched in 2017 as part of the project "Run the Streets" that features footwear and apparel inspired from running silhouette and displays modern look as well as performance. Popularized by the music sensation Weeknd, this shoe turned famous for its aesthetics that presented various versions. Puma unveiled this in mid-top kick in four colorways, including red, and with rich details and neck-breaking branding. The slip-on bootie Puma Fierce Core was made public in 2016 inspired by the dance movements and the strenuous training. This kick was endorsed by the social media celebrity Kylie Jenner which catapulted its success in the sneakers market. While many buyers shared that this pair resembles the Fenty trainers of the famous singer Rihanna, the Fierce One was still applauded for its breathability, comfort, and uniquely stylish look. The Jumping Cat brand unveiled its renowned Suede silhouette in 1968, which is a first in the sneakers' world. This innovation was easily caught the attention of the world when it was publicly used in the Black Salute during the 1968 Olympic awarding ceremony. The Puma Suede Classic Badge, another iteration molded from the classic Pumas Suede, features the OG profile with revamped Formstrip which looks like a sort of a badge. Puma reinvented their archived profile to create luxurious footwear that suits the casual vibe. Dressed in tonal colorways, Puma added some golden accents for a luxurious overall look while staying cozy and durable. This model gloats its breathable and lightweight construction without sacrificing durability and style. The Duplex Evo Knit was molded from the 90s running kick that featured a suede upper with EVA midsole. It boasts the modern technology called Evo Knit construction to create footwear that suits the current consumers' demands. This kick was launched in 2015 that features modern technologies such as Evoknit, Ignite Foam, and the well-ventilated mesh upper. Along with Rihanna's Fenty line, the Puma Tugi Shinsei successfully included in the lifestyle scene with sporty vibe powerhouse in 2017. The family-run business is consistently among the top names when it comes to sneaker culture that is preferred by the young. Wearing Vans red sneakers is simply an ode to youthful and artistic expressions, when one considers the reasoning of sneaker addicts. The contemporary comfort and timeless look of the Vans Anaheim Factory 44 DX made it a solid choice of sneaker fans generation after generation. It brags its comfort and robust elements without preceding its vintage look and vibe. The Canvas Old Skool has stayed true to the comfort and durability of its predecessors by using sturdy canvas on its upper and while keeping all the classic details. Vans released red sneakers version of this for buyers who want to look funky and fresh. This re-imagined classic was injected with leather accents on the canvas upper and striking prints on the lining. The Vans C&L Era 59 is considered more sophisticated and modish with utmost cozy and durability, apt for the skateboarding use. Vans tweaked its four-decade-old silhouette to unveil the grippy, colored sole Vans Black Outsole Sk8-Hi Reissue. The suede panels were stripped off to make it lighter and revamped with canvas upper and leather Sidestripes. One of the oldest sports brands is definitely no slouch when it comes to red sneakers. It is a brand that is perpetually followed by both the old and new generations. Besides the impressive aesthetic value of its shoes, the brand’s sneakers are also sought after by sneaker fans because of their normally exceptional quality and comfort. With the simple design of the Reebok Classic Leather TDC, these red sneakers effortlessly considered suitable kicks for everyday footwear. True to its brand's creed, these shoes were offered with superb craftsmanship, comfort, and durability. The Reebok Classic CL Leather Ripple Mono displays real neck-breaking features for its monochromatic colorways with the ripple pattern on the outsole for enhanced traction and style. While the majority of its predecessor's elements were retained, many modern consumers applauded the jazzy look that is still considered up-to-date. True to its official name, this model presents solid colorway up to the rubber sole. The Reebok Classic Leather Solids delivers superb comfort and support while staying nifty and classic. From a brand that is renowned among fans of sneakers as having superb craftsmanship at very reasonable prices, New Balance certainly carries its extensive weight when it comes to red sneakers. This Boston-based company brings comfort and style to a level that is appreciated by thousands of shoe lovers. With its "back to School" vibe, this model is offered in many colorways that represent some famous colleges in the US. The New Balance Collegiate Pack has suede and mesh upper and unique details rested atop a cushy and comfy midsole. The NB 995 Baseball was unveiled in 2017 as a rework of their classic 995 silhouettes. 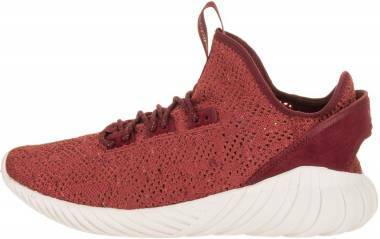 It showcases brown suede and mesh upper with a unique design on the tongue that looks like a baseball mitt. 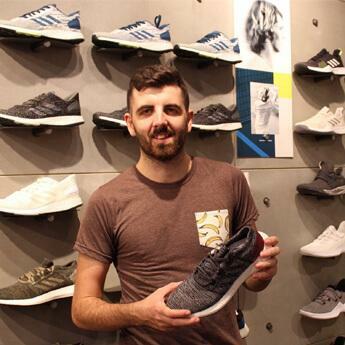 The manufacturers of the some of the earliest, performance-based shoes that were pursued by runners because of their technology and lightweight feel have since then crossed over to the daily lifestyle wear that brings the hallmarks of those amazing shoes. Red sneakers from Saucony are mostly lightweight while still retaining their running DNA. This iteration was first made public in 1981 which was a collaboration with podiatrist Frank Santopietro. The Saucony Jazz Original flawlessly turned as an iconic profile for its voguish look with superb comfort and durability, and superior support. Saucony offers this in a vast array of colorways for buyers to choose. This everyday classic pair brags its vintage look with superb comfort, support, and endurance. 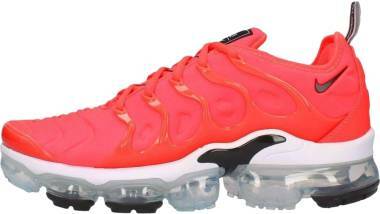 It depicts the bulk of the 80s fashion and promotes low key designed sneakers with technologically advanced elements. Saucony's flagship model-Shadow Original serves as the vital silhouette of the brand. The “sound mind and sound body” mantra keeps on rolling through these years with the incorporation of daily street wear to Asics’ performance-based shoes. Red sneakers from the quality-obsessive are a nice blend of comfort, looks, and reasonable pricing. This pair's Gore-Tex technology makes it an outstanding pair to strut on all kinds of weather. It displays the renowned elements strengthened with GTX, cushioned with the gel system and supported with the shock absorbing midsole. Introduced in 1987, the Asics Gel Lyte V has been tagged as one of the most enduring models in the Gel Lyte series. This lightweight and durable kick features the P-Gel cushioning and V-Gel padding for the 360-degree comfy ride. The brand re-launched this silhouette in 2007, which enthused many designers, artists, and retailers to use it as their base model for collaborations. Iconic is a word that is severely abused in the world of sneakers, but is certainly not the case when it applies to the brand Converse. It is easily one of the most revered names in sneakerdom because of its history, pedigree, and timeless appeal. Red sneakers from the brand are chased by shoe lovers since Converse’s appeal bridged the gap between lifestyle and performance. This model has softer and more refined canvas upper to modernize its classic features. The Converse CTAS Core Hi was incorporated with Ortholite sockliner for excellent comfort with a voguish look. The Converse Chuck Taylor All Star High Top has stayed versatile and dapper since it was initially unveiled, a century ago. This kick swanks its superb craftsmanship while keeping its affordability and stylish features. An upstart company, by industry standards, quickly raised its popularity level by concentrating on the producing shoes for the skateboarding culture in the US. Besides performance-oriented shoes, Supra is well-loved for their glitzy and sometime loud color combinations that never fail to catch the eye. Its red sneakers are among the most flashy options in the hip crowd. The Supra Skytop was released in 2007 as skate shoe which flawlessly crossed the lifestyle scene when it was spotted worn by various celebrities. 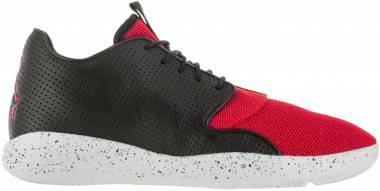 This fresh and modern kick quickly picked as favorite lifestyle sneaker and was recognized as one of the best red sneakers in 2008. Taking a cue from the equally famous Supra Vaider Low, the LC version has a suede upper and lightweight cupsole for better flexibility and durability. This shoe is part of the Crown brand's collection. Like many of the brands in this list, Onitsuka started as a performance-oriented name that has successfully become a staple in the wardrobes of thousands across the globe. Since Uma Thurman’s iconic appearance in Kill Bill, sneakers from this brand have seen a revival of sorts that is hard to match. Red sneakers from Onituka Tiger are usually bought for their history, craftsmanship, and aesthetic appeal. Launched in 2016, the Onitsuka Tiger Mexico Delegation was introduced as a part of the Tiger Stripes' 50th anniversary. This model was molded from the classic Mexico 66 silhouette refurbished with a printed sockliner and Mexico logo on the side. The active profile of the Brooks Vanguard Heritage makes it exceptional in the sneakers domain. The brand preserved the durability and excellent quality that is fitting for the lifestyle landscape, which the Brooks brand is known. This variation is part of the 100th anniversary of the Brooks company. What can red sneakers say about one's personality? While there are no shortcuts in reading other people's personalities, it won't hurt trying to get a glimpse of one's nature by the color of their sneakers. As the classic idiom would say "wear your heart on your sleeves," can be synonymous to "wear your heart on your shoes." Few studies show that our footwear exposes a lot about our natures, as well as by observing our habits, and the way we talk and walk. Wearing red sneakers can be associated with non-conformity. While red is one of the primary colors, it is considered an unorthodox colorway as it draws so much attention. Some people pick red sneakers to stand out from the crowd while appearing superior, dominant, and bold. This perception is rooted from Louis XIV's French court, a period when only men from the upper class can wear red heels as the red dye can only be acquired through importation, which distinguished haves and have-nots. However, in today's trend, wearing red sneakers slowly turns as an acceptable colorway to look better and trendier. Red sneakers are considered a significant trend in 2018, and it was projected that it will inevitably turn remarkable than ever before. The modern fashion states that everyone can now wear red sneakers without feeling too superior, but the essence of the power, boldness, dominance remain. What are the things to consider when buying red lifestyle shoes? It is best to match red sneakers with a monochromatic or light-colored outfit such as black, beige, white, or even gray. These colorways will give a nice base layer to your outfit to make it refined and stylish. This light-colored ensemble compliments your red sneakers and will allow the footwear do the talking. A contrasting color may also work with your red sneakers such as the shade of blue. This shade will add stylish vibe to red sneakers without overemphasizing it. It is not advisable to wear red ensemble with red sneakers or colors that are tertiary to the color red, such as yellow and violet as it will look too far-out and gaudy. For wearers from the areas with a warm climate, it is advised to wear a darker shade of red while users from the regions with cold weather are recommended to grab bright red shade. It is best to keep the color and pattern of your outfit simple as to avoid looking too overboard. While its too risky, experimenting with red sneakers can be fun too. Red sneakers are considered versatile if we want them to. One particular quirk that will make red sneakers work is to tuck it with a bunch of confidence. One surefire advice is to ditch the insecurities and strut your red sneakers. What are the advantages and disadvantages of owning casual red kicks? Red sneakers are good statement pieces and the perfect accessory to spice up your outfit. The red sneakers will give bright and bold hue to your dull and mind-numbing attire and can work as the focal point of the entire guise. This colorway can be a versatile part of your wardrobe if you prefer straightaway changing from formal getup to casual look. The drawback is, red sneakers are not always easy to mix and match up with any ensemble. Red sneakers are tricky to style - if you choose too bland attire, your sneakers will appear out of place. And if you match it up with similar vibrant color, there is a chance that your entire outfit will surely clash. What are the clothes that can be matched up with red fashion sneakers? After Kanye West was seen strutting his bright red Nike Air Yeezy 2, there was a massive clamor for red sneakers all around the globe. While few felt that this kick is a bit fiddly to style because of its bold nature, it is sure fun to experiment with red sneakers. Thus, it is always smart to don clothes that will revolve around and flatter your red sneakers. Red sneakers can go well with black or blue denim jeans with a plain or printed white shirt for a smart casual look. All white outfit look dramatic when paired with red sneakers, such as dresses, jumpsuits, white pants with a white top. For a bolder vibe, you can finish the entire look with black hoodies or biker jackets. Most outfits with the shades of a blue suit the red sneakers, such as blue trousers, coats, and dark or light blue denim jeans for an edgy classic look. Stripes and polka dots with hints of red can work well with red sneakers. Some even pair their red sneakers with black floral short sleeves and black chinos for a neck-breaking look. For a more conservative attire that suits office or corporate settings, red sneakers can be matched up with neutral attire. Such as cream or black trousers with a plain or plaid blazer. The red sneakers will give a relaxed take to your sartorial guise. 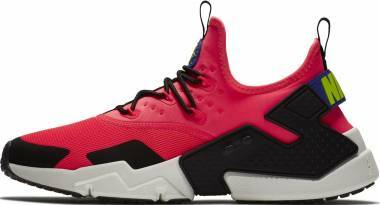 For practical look, ladies can match their leggings with their mid or high-top red sneakers. To stay on-trend while on training, you can match your black, white, or blue sportswear with your red sneakers. In the formal occasions, such as weddings, the bride or even the groom can wear the cheeky red sneakers, which surprisingly becoming more of a trend. What is the "Red Sneaker Effect"? This study presumes that people who do not conform to the norm are given higher regard. Instead of displaying that they could afford the buy expensive things, they are relaying that they can spend their social capital. It's like transmitting that they can still feel successful and influential; without conforming to the standards. Think of Mark Zuckerberg with his hoodies while talking with all his executives. Another name is the Apple CEO Steve Jobs in his black turtleneck and straight-cut jeans. While they hold the highest positions in their respective companies, they prefer offbeat clothes while in a professional setting. The Red Sneaker Test was conducted by recruiting 59 male executives for a public symposium about management, negotiations, and business. A women wearing red sneakers led the seminar. After the convention, the male executives were given a chance to answer questions about the status, prestige, and competence of the women. The result - most of them gave first-rate status, uniqueness, and creativity to the lady speaker. The conclusion is, people who prefer wearing offbeat clothes in a formal, corporate setting are often distinguished as having superior status and more competent than those who dress up conventionally. What is the psychology behind the color red? Life and Love - The red hue is also linked to romantic and familial love. When we celebrate love, we tend to use red outfits or give red roses. The red stimulates more profound and intimate passion found within us. However, too much of it can turn into revenge and anger. Ambition and Confidence - The color red is also believed in giving confidence to those lacking willpower, strong leadership traits, such as determination and enthusiasm. Appetite - Furthermore, red is related to appetite as it increases your craving for food and all other stimuli. Most restaurants use red for this rationale. Luck - This can be observed in the Asian region, where red is associated with luck. Chinese use mostly red in their businesses, special occasions, and in their churches as it attracts luck and good fortune. Dominance - Athletes prefer red as it gives them a more aggressive and powerful feel, thus boosts their testosterone level in their blood. There is a study that teams who wore red had more significant chance of winning than those who wore blue. This color echoes strong and powerful masculine energy. Energy and Aggression - This color is associated with the increase in heart and respiration rate that may lead to irritation and aggression. Red also energizes thus it excites the emotions and serves as motivation too. Danger - Red has been used in fight or flight response when one feels they are in danger. The respondent will either feel more hostile or stressed out. Too much red will make us feel agitated while too little will tend to make us feel fearful.